Was John McCain Free to Die with Dignity? You are here: Home / Uncategorized / Was John McCain Free to Die with Dignity? Imagine being John McCain and told you have an incurable brain tumor. What thoughts run through your mind? What’s your main priority? How would you want others to treat you? “I don’t know” is the most likely answer. After the shock and awe, a silent “Hallelujah!” rang across the nation in praise of John McCain’s self-determination and personal freedom. “The Maverick” was now free to die with dignity! As death is certain, personal dignity calls one to accept his inevitable fate. Patients are often plagued by the perception of dignity as standing up and fighting for oneself. But personal dignity is a given that doesn’t need to be defended. The inherent dignity of each person lies in the subconscious as a spiritual truth and sacred trust. It’s a passive force that allows one to stand in stillness, silence and humility. To this end, did John McCain have the right to remain silent with time for introspection? Or was he immediately sentenced to the next step of futile curative treatment? Why did the nation support Senator McCain’s fight to the end? Why didn’t anyone come forward and encourage him to accept his fate a year ago? We might all be guilty and ashamed of failing to allow John McCain to die with dignity. Instead, he was afforded the best medical treatment. At what point are physicians called to be honest with terminally-ill patients and discourage them from receiving further medical treatment? If this doesn’t occur when the terminal illness is first diagnosed, the path of least resistance that allows nature to take its course is being denied to patients. Seemingly, dignity was not a viable option for John McCain. One treatment led to surgery for intestinal blockage and so on. Medical intervention did not end until the day before he died. Does fighting until the end symbolize dignity or serve gluttons for punishment? As an emergency physician, I accept that all the “doctoring” in the world cannot cure terminal illness. Dying with dignity becomes the reconciliation between holding out hope and letting go of ego for both physician and patient. The emergency room is the perfect crucible to seize the “coming to Jesus” moment of accepting one’s fate. The fact that patients are in the ER indicates that their situations are unmanageable and oftentimes insufferable. By saying, “You’re in a heap of trouble, let’s make it easier- not harder,” I let down my guard (ego) and give up hope – setting the example for humility. What often follows is that patients discontinue further medical treatment and hospital readmission. 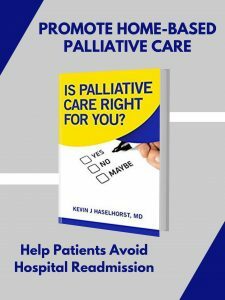 Priorities shift from hospital-based medical treatment to home-based palliative care and my duty to treat becomes replaced with providing pastoral serves for these patients. They are now free to accept their fates, follow their own hearts and live happily ever after – free from judgement, condemnation and indignation. Life is uncertain and tenuous at best. Doubts about following the right path persist. We often hope for the best without actually ever hoping to die. As long as terminal illness seen as the worst thing that could ever happen, resistance to death persists. Hope springs eternal for a miraculous cure with victory over the grave. It’s time we begin hoping to die one day. We could then perceive terminal illness as a window of opportunity to this end. Ask, “What opportunity awaits near the end of life?” The short answer is being free from restrictions and believing that there’s nothing you need to prove or do. When you’re allowed to live like there’s no tomorrow, who cares what you do? Without resistance to death, you’re immersed in a peaceful, easy feeling of living freely. Letting go is not giving up – it’s moving on. It’s the practice of forgiveness and receptivity. It’s being open to what’s next when things don’t go as planned. It’s having the ability to trust from a deeper part of your being. Finally, it’s setting aside hope and experiencing the rewards of unconditional love. How a man reacts or responds to what happens reveals his true nature. 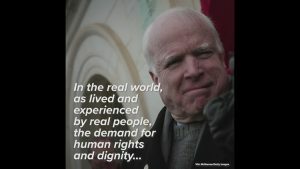 Did John McCain show himself to be a human being or a spiritual being? By reacting to his terminal illness as an adversary, he proved that he was more human. A spiritual being feels blessed no matter what happens and responds with humility. The LORD is my shepherd, I lack nothing. He makes me lie down in green pastures, he leads me beside quiet waters; he refreshes my soul. He guides me along the right paths for his name’s sake. Medical treatment stood in the way of John McCain being able to accept his fate and dying with dignity. We’re all complicit in having denied and delayed Senator McCain an expeditious final blessing through subsidizing the standard of care set forth by Medicare and the healthcare system at large. Senator John McCain fought for freedom throughout the world, but failed to claim his own freedom from needing to beat the odds of dying from a terminal illness. McCain freely admits that he’s made mistakes in life, but are we apt to repeat his misguided judgment or free to die with dignity?